Advertiser.ie - Can you escape the zombies on the Prom? On Saturday October 29, a crowd of terrifying zombies will be released onto the Salthill Prom. 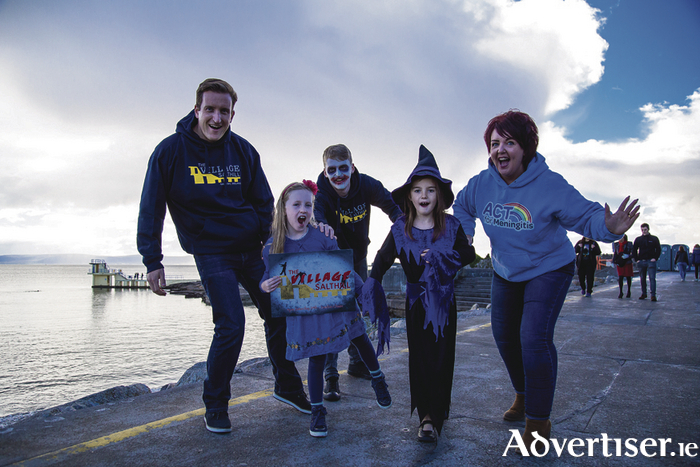 Their mission, to capture every human (big or small ) who dares to take on the challenge of “The Village Salthill Zombie Chase” and prevent them from making it to the Safety Zone of Salthill Park! The Zombie Chase is a unique family 2k chase in aid of the national support and awareness charity ACT for Meningitis, which has been organised by the newly formed community association of local business owners “The Village Salthill”. The group are eager to promote and rejuvenate the general Salthill area including its interaction with arts and culture, improved parks and amenities and a general improvement of the Salthill area and are working together to ensure Salthill is a great place to live, work in, visit and of course be chased by Zombies! Speaking at the launch of The Zombie Chase, group member Ross Curran says; “We are very excited to be working on this amazing event and extremely proud to be raising funds for such a deserving charity, ACT for Meningitis, who do tremendous work in our community and indeed nationwide by raising life saving awareness and providing a wide range of free support services to anyone in Ireland affected by Meningitis. The Zombie Chase will begin at 4pm at South Park, Claddagh and once released, the terrifying demons will chase our humans along the prom attempting to “capture” them by stealing their tags! All humans that make it to the Safety Zone in Salthill Park with tags intact will be entered into a draw and in with the chance of winning The Ultimate Village Sathill Family Day Out! All little humans taking part will be rewarded with a finishers goodie-bag in Leisureland Hall where refreshments will also be served after the chase. Spot prizes will also be given for best fancy dress and best photo of the day. Further details on this can be found on “The Village Salthill” facebook page. Places are limited so to avoid disappointment, register online at www.iregister.ie/zombiechase Adults are €10 and kids u12 are €5. Limited Registration and Tag Collection will take place at the Claddagh Hall on the day from 2.30 to 3.30pm.